There’s nothing like the sight of a pair of Arabian Nights Serendib Efreets, staring down an Alpha Serra Angel. Well, maybe a double Beta Dark Ritual into a heavily played Juzam Djinn sitting staunchly across from an Alpha Juggernaut, freshly cast on the first turn off of a well-loved Mox and a Mishra’s Workshop. 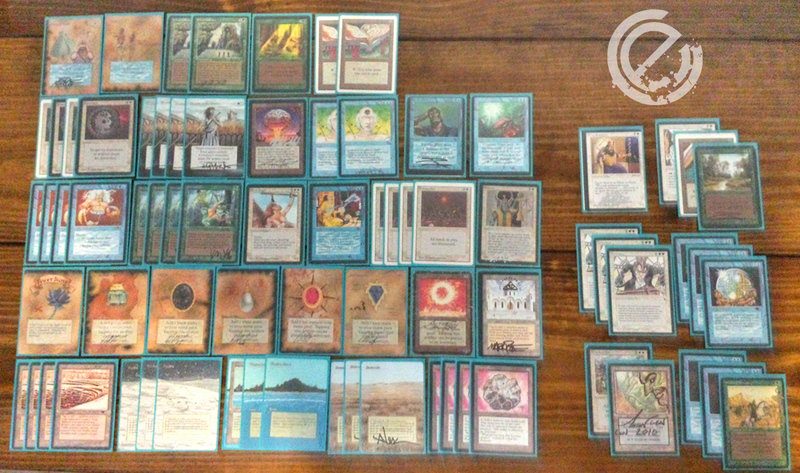 Welcome to our first installment on Old School 93-94 Magic decks! You’ll notice that this list observes the restricted Mana Drain suggestion for most playgroups. Without access to any acceptable Alpha, Beta, or Unlimited Counterspells at the moment, I decided to brew up something less controlling, and more focused on playing the Tempo role and blowing up lands. Whenever I play Magic I love blowing up my opponent’s permanents, and smile with devious amusement inside at the rare sight of a barren battlefield in front of my enemy, stripped of meaningful interaction. The decklist is above, and the current version of the deck is shown in the photograph below for your enjoyment. You’ll notice the lack of Alpha and Beta cards in certain cases (ahem, most of the White removal), but at least they’re Unlimited. We can’t be playing with proxies. Perhaps when the pimp Counterspells are in hand they will be added to the deck, trimming a couple of other cards here and there. Regarding the altered Power, when put together they form a Goonies-style treasure map (you can see a full pic here). Play efficient threats, annihilate permanents, and get ahead on small incremental advantages. Let’s quickly review this in order. In this Bant deck we’ve chosen only creatures that will survive an opposing Lightning Bolt or Chain Lightning, to dramatically narrow down our opponent’s chances of removing our threats. Serendib Efreet and Erhnam Djinn are relatively efficient compared to their casting cost, and Serra Angel and Serendib can both fly over opposing blockers (and circumvent Moat). Swords to Plowshares, Balance, and Terror are about all that you’ll regularly play against that will remove these threats, with things like Wrath of God, Psionic Blast, City in a Bottle, or Nevinyrral’s Disk less frequently seen (but still worth keeping in mind to play around). This deck maxes out on the most efficient White removal spells with 4 Swords to Plowshares, 4 Disenchants, and 4 Armageddons. Swords is an obvious pick, but Disenchant is quite important, and easily one of the Top 5 most important cards in Old School, for its ability to wipe out pesky permanents ranging from Icy Manipulator, to The Abyss, to the aforementioned City in a Bottle, and is almost never dead in a single game. I would probably play 6 copies if I could. Armageddon is very good in this deck in particular, because with all of the artifact acceleration it allows you to play a single efficient threat, and then wipe out the lands and let your creature(s) go to town. Likewise, you can often let your opponent play into it to by playing a number of lands to cast their spells, and then remove them end step with a Swords or Disenchant, and then trade an Armageddon for a good number of their lands, and then go about your business. After playing the deck a handful of times I think this is still a great card, but we might look at moving the 4th one to the sideboard for matches where it really shines, if those black bordered Counterspells are going to make it into the deck. Rounding things out are the essential Chaos Orb, Balance, and a singleton Psionic Blast and Control Magic. It’s a nice mixture of cards to handle corner cases, and also catch the opponent off guard. The standard Blue draw package of Ancestral Recall, Time Walk, and Braingeyser has been slightly tweaked here. As we don’t want any hugely expensive draw spells, so Braingeyser has been dropped in favor of Sylvan Library, which we’ll expand on a bit briefly below. There’s also a pair of Jayemdae Tomes to sink mana into, as there are often multiple turns where you just want to do something on your opponent’s end step. Sometimes that’s draw another card, and sometimes it’s blowing up their stuff with your instant speed removal (or to bait an end-step Counterspell). The Tomes can be replaced at will for other interesting cards. With modern deck building principles well known and articulated at this point, it should be obvious that one of the best ways to win in Magic is to reduce variance in your deck and your draws. With this increased consistency and access to the cards you want, when you want them, you will more often have the cards you need in a given situation. Sensei’s Divining Top and Brainstorm are the hallmarks of this in the modern era. Sylvan Library is the progenitor to all of these effects, and is very potent in 93-94 Magic, especially in decks like this. After blowing up things and counting on casting spells hopefully every turn to either develop or push your advantage, Sylvan Library allows you to more easily find the cards you need, and refill your hand quickly. Swords to Plowshares is probably the most commonly played removal spell in Old School, and every time they give you more life by exiling your creatures, you grab more cards with Sylvan Library. Sylvan is probably the single most underrated card in 93-94. Jayemdae Tome is powerful and a nice source of card advantage, but is a very heavy mana investment, turn after turn. It takes 12 mana to get ahead by one card, whereas with Sylvan Library it’s a single 2 mana investment, and as much life as you can and want to sink into drawing more cards. 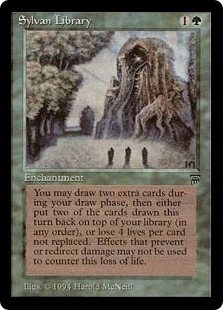 One interesting thing to note with Sylvan Library is the interaction with other commonly played cards in 93-94 Magic. Howling Mine’s draws will stack with Sylvan, so with 1 Howling Mine in play you can effectively choose to draw 4 and then put 2 back (see old D’Angelo CrystalKeep rulings here), and so on. Likewise, the extra draws from Sylvan Library will trigger anything that affects drawn cards, such as the damage from an opponent’s Underworld Dreams. There’s been a good bit of discussion about whether or not Strip Mine should be unrestricted in 93-94 Magic, as it was back in the day. Released in March 1994 in the Antiquities expansion, Strip Mine was widely played as a 4-of in many decks throughout early Type 1/Vintage history, until late 1997, when Tempest was released. 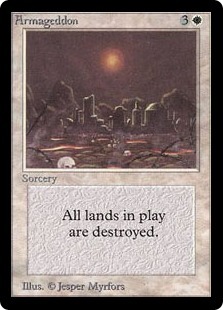 Wasteland’s arrival provided an abundance of free land destruction, so at that time Strip Mine was placed on the Type 1 Restricted List, effective January 1 1998. In our recommended Banned & Restricted List for 93-94 Magic (found here), we’ve got Strip Mine on the Watch List, meaning we’re allowing 4 in our environment. In practice this plays out very similar to the role of Wasteland in Vintage and Legacy today, as you never really want to keep a 1 land hand, just because of the presence of Wasteland (or in this case, Strip Mine). Playing the games out with unrestricted Strip Mine occasionally creates scenarios where someone is stuck on mana for a few turns, but it often allows for better game play in Old School Magic. Having access to more Strip Mines reduces the demonstrative power of Library of Alexandria, Maze of Ith, and Mishra’s Factory, which often go unchecked in Old School Magic. The tactical decisions of what hands to keep, what lands to sequence in what order, and when to Strip Mine your opponent actually increase the strategy of in-game play, and we haven’t seen enough negative consequences to warrant restriction at this time. In the Bant deck above, Strip Mine often acts as a Tempo play either early or in the mid-game, as a follow up to Armageddon, for example. It also helps temporarily shut off an opponent from a key color or two, allowing you to sneak more damage in, or evade countermagic for a turn or two. The main deck has a handful of options for dealing with creature-based opponents, but really packs more answers in the sideboard to deal with the hordes. 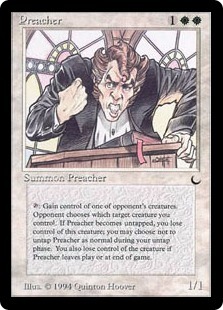 Preacher, Wrath of God, Forcefield, and Maze of Ith are all effective solutions. Greater Realm of Preservation is an overlooked card that provides a cheap hedge against Mono Black and burn-heavy strategies. Energy Flux is a very interesting choice for 93-94 Magic, as a lot of the control decks rely so heavily on artifacts to get ahead. You can often side out some of your own (such as Fellwar Stone) in order to mitigate the damage Flux would do to you, but it is a very powerful option, especially in conjunction with Armageddon. Dandan and Whirling Dervish serve as unique options against certain decks where they would individually shine. Whirling Dervish can singlehandedly wreck a Mono Black deck, and Dandan can provide a more aggressive tactic against the Control decks that are settling in for a long game of attrition. Dust to Dust in another great option to consider against those decks that rely heavily on artifacts for either mana or as part of their central tenet, and can provide more small incremental advantage against the grindier matchups as well. There are a host of sweet options when considering what to play in Old School Magic, and I hope you’ve enjoyed a look into this Ehrnam-Geddon style Bant deck. Until next time, may your Chaos Orbs always flip 360 degrees, and may your Kird Apes always find trees.